Get detailed reports about incomplete purchases to help you troubleshoot the checkout process and recover lost sales. Formulating insights into your customers’ shopping habits and eliminating barriers to sales is an important part of developing your ecommerce business and ultimately maximizing overall sales. 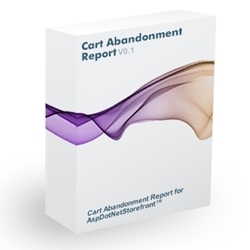 The Cart Abandonment Report add-on gives you the tools to analyze and correct checkout issues and recover lost sales. This is one of our most popular add-ons - clients say it quickly pays for itself! Make the most of the Cart Abandonment Report with the Automated Emailing option and automatically follow up incomplete sales with your pre-written email. Just set the automatic email offset and the system takes care of the rest! ***NEW: the MultiStore Automated version now supports up to 3 automatic email follow ups! Each email has its own offset/delay and different content! Response:Thank you Kim, we have the ability to add a Google Analytics tracking token to the URLs (this is a setting in the plugin) and also you have the opportunity to modify the emails going out (they are topics) so you can include any coupon etc you would like there! Response:Thank you Rick, yes the Automation gives you 3 separate email follow up instances per cart/customer. You would only need the VB conversion if you have a VB version of the cart...most have C# however. - Easy install instructions with a readme included in the download. Excellent tool! No site should operate without it even over 80% of the top 1,000 sites don't offer this feature. This is excellent. I only wish it could send out automatic emails after so many days. Purchased the PLUS edition. This is a very valuable tool to have. Without it you are missing out on a lot of valuable information. Also, being able to contact the customers with a reminder at the click of a button is very helpful. The installation was easier than I would have imagined as well. Two files to dag and drop into an FTP folder, one file to add a line of code to, and one SQL statement to run via the admin and you are all set! Highly recommended.